I am eager to see what results would be in the practice, particularly for beards and at wide end. Meanwhile, I would also like to see a 1" sensor compact with telephoto zoom with macro capabilities and large aperture (2.8-4.0) ONLY. Say 150-600, or even 1000mm, with HQ image. (And not as expensive as Sony RX10 Mk IV. It should be easier to make, I suppose, than wide angle to super-tele. Long ago I had the opportunity to try friends Fuji ultrazoom camera (HS10) - it was useful at telephoto end (it was 720mm eq. ), but very poor as a wide angle (24mm). Panasonic makes a couple that get close. The RX10-III is about $400 less than the IV. if you are interested in shooting beards, you don't need that much zoom. All you need is co operation from the man. Be it goatee, french anything, a plain simple tele lens is enough. If you go to Pakistan or Arab countries, every other man you take photo of will have beard. He obviously meant flying beards. You can mount a Nikon F mount telezoom on a Nikon 1 body. Some combinations will give you a lot of reach for less money than a Sony RX10 IV. Oh..yeah.. I get this point now..
so to take flying beards, mostly pilots or some passengers , yes this super ultra zooms are must. Who's this for? It's for those that loves the nature and wildlife photography, but are not going to invest in pro gear. For people who has the means but not the will to commit to "system". I see Yellowstone road trips. I have a "system", but wouldn't mind this this as a back up for my nature stuff. The reach has certain fun factor. Who's this for? Those with CRT monitors with 640x480 (VGA) resolution? I would be reluctant to get it out of my bag if the weather is fine, but there are LOTS of times when I wouldn't risk a D810 in adverse weather. At a measly $1000, this could be the difference between getting a reasonable shot or NO shot. I have the P900 and live on the east coast. The P900 is very useful for bird pictures of sandpipers (birds 5 or 6 inches long) and gulls that like to rest on sandbars and beaches. You can't get very close to them normally so a long zoom is necessary (along with adding extra weight to the tripod to hold it steady). This camera may be better if the picture quality is the same. This looks like something H. R. Geiger would have designed. Is this what became of the DL 25-400?? At least two DL 25-400s would be required to create one of these. Yes you're right, 24-500. It's been so long I forgot. Quick edit: "This shot shots off the P1000's generously-sized grip" - should probably say "shows off". Feel free to delete this comment after making the change. For such an ambitious zoom range, zooming might easily involve moving multiple lens element groups together at different speeds. Implementing that with multiple motors is easier than via a mechanical system. 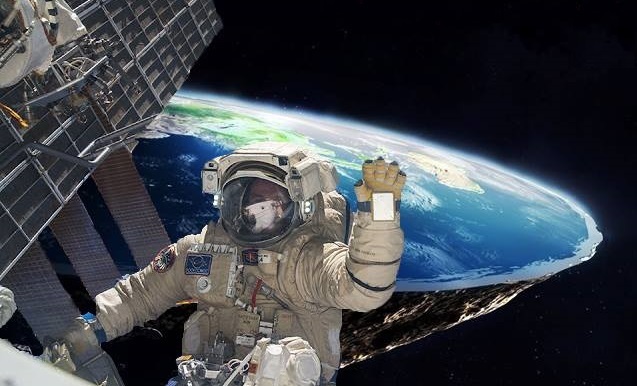 I wonder if the sensor is moving around in there as well? Would that make any sense? Nikon, you gave up from great small DL series with 1" sensor to bring us this funny thing? If it were a 1/2.5" it would be f/64 according to my handy Zeiss format comparison table, p.10: https://diglloyd.com/articles/ZeissPDF/ZeissWhitePapers/Zeiss-DepthOfField-Bokeh.pdf. So a 1/2.3" sensor I would guess it's around f/45. A bit of diffraction for sure. In an earlier post I calculated f/42.2 @ 3000mm. Could this create pricing war with Sony or is this just a totally different beast with the sensor size? I was under the impression when you try to do these all in one solutions something has to give. Quality and performance wise it may be better not to go to theses extremes. $1,000 for this vs well over $1k for Sony who knows if this will undercut Sony and or will Sony uses switch to Nikon ?? Very different user profile. I have the RX10-IV and bought it after looking at the P900 because I wanted the larger sensor and am OK without the extreme reach. Others will want the reach. Great that there are cameras to accommodate both market segments. So, who exactly is this camera aimed at? The current UK price is far too high. Okay, it may drop. The sensor is too small and it should be at least 1/1.7 and ideally a bit bigger, even if that means less focal length. 16mp is really not good enough when Canon can do better with their cheap pocket compacts that are 20mp. The size of this camera is too big and who is really going to need a 3k equivalent focal length for their holiday snaps? Don't tell me, the kind of people who normally use phones in the upright position for everything and know nothing about photography! The camera is a bit of joke really for people who simply think that size matters. You really don't get the point of the camera if you're asking for bigger sensor and shorter focal length. I think he gets the point. This is a huge camera with a tiny sensor. The zoom range is preposterous. I only use super zoom cams and can tell you tele ends over 50x is getting into unusable for hand holding and atmospheric conditions. This one is a dog. I do hope Canon gets the point, has a good laugh and doesn't follow suit. I'm using long lenses too. My longest combo with my D7000 (which incidentally is 16mpix too) gives me an equivalent focal of 1500mm. You can use very long lenses only in the early morning. I can hand hold my 30 years old reflex nikkor c 500mm which isn't stabilized. Stating that 16mpix isn't enough just shows the misunderstanding about photography (And optics laws) Venture-Star has. It's a super zoom camera, whay try to say it shouldn't have a super zoom?!!! Tourlou: I've no wish to be rude, but telling me I misunderstand photography and optics law (?) when you clearly don't grasp any of the detail is actually rather amusing. You are presumably aware that the APS-C sensor used in a Nikon D7000 is somewhat larger than the camera in question? I won't bother with your comment stating that 16 mp is inadequate as you are clearly not familiar with small sensors, or what's currently in use at this level. So let's see, you have a old 500mm Nikon mirror lens and I assume a 2x tele converter to give you your 1500mm eqv focal length, which produces a very small aperture. Not quite sure how you can only use this in the early morning as I'm surprised you can use it for anything worthwhile, even on a tripod in optimal conditions. The kind of people who DON'T go to Blackpool and sit on the "beach" with a handkerchief knotted at the corners on their heads! How does such a humungus camera with such a tiny 1/2.3" sensor inside even overheats? Easy - just put in an obsolete processor and enjoy warm hands in winter. If Nikon can make camera with so huge lens system... Maybe would be better to let this whole power go to something else expect focal leight. I dont know.. maybe fastest aperture ? How about 24-1000 2.8 ? Sony started with a 24-200 mm f/2.8 with the RX10 and then switched to 24-600 mm f/2.8-4. Apparently zoom range is more appealing than lens speed. Good grief - how many dead plastic bottles did it take to make that thing! Looking at pic 5, why don't they equip DSLRs with flash pop-up mechanisms like that? Might just get it far enough out of the way to avoid shadows with a wide lens. Looks pretty cool. "Bridge compacts" are mostly a bridge between nowhere and uncertain, perhaps, but they need to belong to some sort of niche, and this one is likely birds in bright daylight, or pretty girls and their horses. This camera will never appeal to the "Go FF or Go Home" crowd, and it never was meant to. This camera will appeal to people who may want to take pictures of wildlife or birds really zoomed in and do not want to carry a bazooka or don't want to or can't spend multiple thousands on camera gear. Yes, the quality may not match a FF camera and matching long lens, but its quality will be good enough for the target audience. Great Camera Nikon! Thanks for releasing something unique. good enough for the target audience ... those with 20:60 visual acuity? "Go FF or Go Home" people still exist? How about Jupiter's moons mode? I think the ISS moves significantly faster than the moon. Harder to frame, not sure about motion blur. Jupiter moons mode!!! Lol!!! I have a 10 inches f/5 (1250mm focal) Meade Lightbridge Dobsonian and We can see Jupiter major moons pretty well with a 6mm Plossl attached! Jupiter's 4 moons are easy. I caught them last night in my 30mm f/5 finder scope (150mm FL) using a tiny ZWO video cam. Io, Europa, Ganymede and Callisto, all part of America's Manifest Destiny! Looking forward to this. So I have the P900 great camera very much underrated. I shoot DSLR and Bridge cameras. I have compared images of this to my DSLR and it is difficult to tell the difference when shooting under favorable Conditions. Light weight and price friendly not for this bridge camera. Then again, in price vs image quality, you're getting a steal in the DSLR. I like bridge cameras too. I love my Panasonic fz150. It weighs 528g. This Nikon weighs 1415g. That is ridiculous. For me, because I'm used to doing street and being flexible, my Canon SX60 at 650g is the limit of how much a bridge camera should weigh. (You really notice the extra 122g). To more than double that is silly. What happened to Fuji's 2/3 X-S1? I think they will not update that one. That's one big mother of a 'compact' or Bridge camera! It will be interesting to see a practical comparison of this camera compared to a similarly priced telephoto lens fitted to an APS-C interchangeable lens camera of any brand. It may be that despite the rather small maximum aperture at the long end, that it will take perfectly adequate pictures in reasonably good light, thus making it a compelling alternative to a much more expensive specialist/pro lens. For many people. I can literally not think of a camera I would want less then this one. Absolutely terrible. Is this a rebranded Vivitar camera? Sure makes me wonder from the IQ lol. Makofoto - Thanks for proving my point...you posted a grainy, soft image. This is truly a head scratcher. With that tiny sensor and F8 min aperture at fully extended zoom, the slow shutter speed at F8 will make this a point and shoot at still objects, at the very best. And then we have diffraction. And this incredibly clumsy looking body and lens combo. One of the funniest tings is the built in (Goose neck) flash, will surely light up your moon shots! Now how did this gets past management scrutiny? Of course the flash illuminated the face of the moon, you silly... How do you think they got to separate the shadows from it? Stop asking nonsense, idiotic questions. @Andreas Berglund, likely because the target market for this camera only looks at the relative zoom numbers, does not understand how diffraction or sensor size plays into this. That segment of the market probably demands that it has a flash. Something you've not mentioned DPR that is available as an optional accessory is the Bluetooth Remote. Control for focus, shutter & zoom...would be worth it for shake free shutter release. MannyZero; movie, or neighbors perhaps? there was an OMG and then "we'll never fit that on the album cover." I have the P900 for a couple of years. Used it for travel and other leisure shootings. 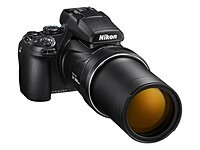 I shall look forward to the P1000 as the replacement and it seems Nikon has listened to the P900 users' comments/wishes. If you upscaled a shot of the moon taken with the RX10iii or iv by a factor of five (3000/600) the image quality would be simply ghastly! Added to that, you'd finish up with 23,040 x 17,280 pixel image (398mp) ! But that's what I'm suggesting might not be the case. I've seen a comparison like that of RX100 with a standard small sensor sony 30x compact camera. The lens/sensor combination is apparently *so much* better on rx, that the long lens is of questionable meaning. (Except in that case too, it results in lower price). I'm suggesting the same might be true here. The image size you mention isn't really relevant - and you'd crop what you want, too. Almost all moon shots are limited by atmospheric conditions at the moment of capture (and luck). Rather than optical performance. Moon is the worst test object to compare cameras. Not true. There is a huge variation of moon image quality between long zoom cameras, as I have seen from using a few, and look at any comparison review online. Atmospheric conditions change, and "seeing" changes moment to moment, but I find it really helps to take more than one shot. You don't need to do this comparison. Just pick any image you want out of your vast collection and upscale 5x then crop it to 'what you want'. I'm telling you the image quality will be a joke! Are you talking between an RX10 and a p900? I never used either one to compare, so I wouldn't know if it's a "joke". rcl100, it's funny I just today started a forum thread about what garbage this commenting system is. :D Horacecoker is actually replying to my comment. To which I reply, it just depends on how each image was captured. I'll explain no further and I'm not saying it's the case, rather I'd like DPR to do such a test. Btw, it isn't exactly a 5x scale since the two sensors are different resolution (rx10 mk4 is higher). Maybe a 1/1.7" sensor would've been nicer. Then again I don't know the Technical logarithms, algorithms, and all the ithms that would've been involved for that. There's a promo video with that lion. Frankly I don't see the big deal that at 2000mm we get a lion's mugshot and at 3000mm we get the eyes. Is that a 1000mm advantage? Mighty glass, yes. This is no longer a Bridge Camera. This is a Telescope Cam. A bazooka of a camera...!! Expect that bystanders won't say ah, oh.. They will ask you: WHERE ARE YOU GOING WITH THAT, BOY? HAVE YOU GOT A LICENSE FOR THAT? Going from 2000 mm to 3000 mm means roughly “getting 1.5 times as close” as before, while going from 25 mm to 1025 mm means “getting 41 times as close” as before. In both cases you increase the focal length by 1000 mm, but one time it implies only a small enlargement and in the other case it implies a huge enlargement. So a “1000mm advantage” doesn’t really say much. It’s more useful to look at the factor by which the focal length increases. is the len Nano crystal coated? it can help rise up image quality a little bit! I joke but I am always on the side of more realistic usefulness in cameras rather than crazy overblown specs. That sized lens could have made a really great photo and video tool with some different direction. Just my opinion. Every other camera made has "more realistic usefulness" according to your definition. So how many more cameras like that do we need ? People are only going to buy so many of them, so you might as well make something different, even if it is a niche product. I agree that it feels gimmicky, with f/8 max aperture and a 1/2.3" sensor. Thom Hogan pointed out that even under Sunny f16 conditions, at f/8, you're at 1/400s at base ISO on this camera, which isn't going to be fast enough for some of the uses people would like a long tele for. But there's already a camera for pretty much every need, so why not ? I guess the RX 10 series has a lot of ground already covered but I would think pushing the boundaries of light rather than focal length are more "useful". But that is just my opinion and others might want that much zoom. I could see that. Not being a P900 user, I have no idea what people would be looking for. Going faster rather than longer seems like just as valid a choice to me ... but then again, it's for that reason that I'm an RX10 owner and not a P900 owner (or ever even considered such a camera). At leas it sounds like they did address common complaints (raw & EVF). I think things are pretty simple here - this is the only hope for ultrazoom users. Others are old and slow or new but with deal-breakers flaws. Even Nikon's b700... Without autoISO in M mode, for example... All Panasonic's destructively compress raws, FZ82 - bad IS, very slow sensor readout speed, no variangle screen - so no option. Canon sx60hs old and very slow. Sony RX10m3/4 are good, but expensive and not quite ultrazooms. And - that's all... So, It would be very kindly for DPR to pay attention for this small sensor camera and bring us the review. Like SX50HS had - excellent review. Yes the Sony RX10 3/4 are "only" 600mm, but they are F4 on a 1 inch chip, compared to F8 on a 1/2.3inch chip. Not only is the equivalent aperture (F10.8) about 4 stops brighter than the equivalent aperture on the Nikon(F44.8), but the Nikon will be heavily limited by diffraction at 3000mm. No doubt the Sony will win at 600mm, but my guess is that even cropped to 1200mm the Sony could still outperform the Nikon. At some point however that will change. Would be interesting to see where that is and a nice idea to include in a DPreview test. At 2x crop the Sony is a 5MP camera - it wouldn't surprise me if the Panasonic wins that battle. If you go for a large heavy lens similar to the P1000 (same entrance pupil) this would result in a 1000mm F5.6 with 1 inch chip. This should be a very capable camera. That said I think the 1095g of the RX10 IV is more than enough and the 1425g of the Nikon are too heavy. So if you keep the entrance pupil of the RX10 IV you could still get a 830mm F5.6. This should be a very capable combo. For the Airy disk it's not the pixel size that matters but at least two pixels worth (due to bayer, etc. ), so in other words it's about 3.3MP (although you measure the Airy disk in a way I hadn't expected, as I was thinking it's 10.7um at f8). Plus that's where the diffraction won't be noticeable, you can go some way higher before it becomes really objectionable. Look at it this way, my 5Dsr is really sharp at f8 and the P1000's pixels are 1/3 the diameter. Folks, to repeat. The diffraction limit of that P1000 at F8 is 4MP, not 1MP. The P1000 has a 539mm/F8 lens (ø 67mm), the RX10 IV has a 220mm/F4 lens (ø 55mm). Therefore, the diffraction-limited resolution for the P1000 is only 22% higher. However, the RX10 isn‘t diffraction-limited, it has too few pixels for that. The P1000 *is* diffraction-limited, resolving only about 2.3k video or 4MP still at F8. Which is about a max. EFFECTIVE focal length of 1500 mm still, 1800 mm 4k, 3600 mm FullHD (incl. dig.zoom). Not as advertized, still pretty amazing. Esp. the last figure. @panther fan - agree, that's why I keep complaining about that I can't find anywhere even one test comparing small sensor ultrazoom with APS-C + tamron 18-400 for example. Then it's really interesting to know exact focal length/max aperture specs for P1000. @panther fan - but remember the Airy Disk isn't like pixels and discrete, it's blur and each pixel will see something different (if the image is changing in that direction), it's just a case of how slowly it changes. Also diffraction effects increase gradually. I reckon there should no noticeable diffraction effects at 3.3MP and f8 (all other conditions, like lens and air, allowing) but as the pixel count goes up you see more detail. Overall image resolution is the lowest resolution part of the imaging system (often the lens) reduced by the effect of all the other parts. Each time some part increases in resolution (e.g. higher-MP sensor) the overall sharpness goes up. How much it goes up depends on how bad it was already (if your lens resolves 3MP and you go from a 30MP to 50MP sensor the effect will be very small). The diffraction-limited MTF of a line-pair (lp) pattern is a closed known formula. Using the usual two pixels per lp, you get 14% MTF with a 4MP pattern. Period. 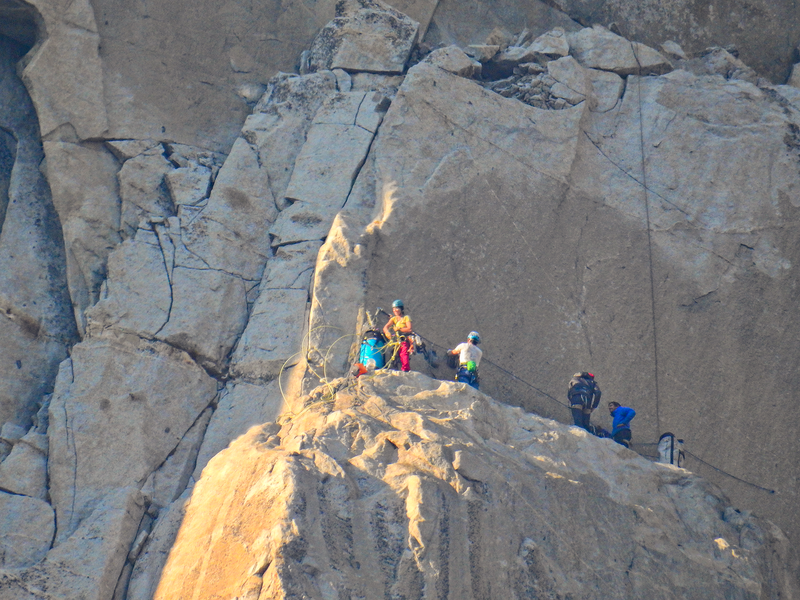 Yes, called digital zoom (up to 2x crop, 6000 mm). But it will then only have 720p HD effective resolution because of diffraction blur. I don't mean digital zoom, I mean the same crop as in FZ1000 for example. A 2x digital zoom in 1080p and a 0.5x crop in 4k are the same. Think about it. Why do you talk about digital zoom? Crop has nothing to do with it. @Elaka Farmor - yes, but even more - I need to know sensor readout speed in 4K. Because panasonic FZ82 is so slow, and it's own IS system so poor that it absolutely can't keep rolling shutter from camera shaking away even at 300mm. It was huge disappointment for me. SX50HS, though only in 1080p, was much more balanced. I downloaded then RX10m4 examples at 600mm - it's a way much better than FZ82. What do you think digital zoom does? It crops. More specifically, it is called lossless digital zoom if it crops a lower resolution region from a higher resolution image, like a 1080p 0.5x crop from a 4k (2160p) image. However, the lossless digital zoom feature in the P1000 needs verification. So far, it is just my assumption. Nikon calls this "Dynamic Fine Zoom". One needs to find out if 2x Dynamic Fine Zoom in 1080p 30fps is created from a cropped 4k 30fps feed of the full sensor. I couldn't find a source to confirm. If you mean if it can losslessly crop in 4k mode ... then no. The sensor is 4608px wide, almost 4k already. 3840/4608 would be a 83% (1.2x) crop only. falconeyes - the widest you can record in 4K with FZ1000 is 36mm. In 1080p it is 25mm. You mean for real that 36mm in 4K is digital zoom (and not a crop of the sensor)??? @Elaka Farmor - I never heard that any camera crop in 4K digitally, only case - implementing additional electronic IS. And I believe, with 3000mm it will be implemented. Though not every camera is powerfull enough to do real-time electronic IS in 4K. We have to wait for review, I hope that DPR is planning one. I wish Canon would update their SX60. Going for wider instead of longer. Gimme an 18-1200mm. I don't care how many aliens you have to hire, you get it done Canon! I agree, that 18-50 1 inch camera was definitely going to be my holiday camera if it was made. I hope Sony decide to put out one now. I want a real 18-1200mm (for full frame of course). I feel like they could have done much more useful things with that massive an aperture (67mm) than pull it all the way out to 3000mm. 67mm is enough for f2.8 at 1000mm, for example. What if this thing were constant aperture but stopped at 1000mm? Wouldn't that be a more interesting beast? RX10m4 reaches 600mm f4 with a much larger image circle. The smaller 1/2.33" is probably best kept at f2.8 but there's no reason that can't step out further than the Sony with the sensor size advantage. 67mm on the P1000 is a huge aperture! Just for comparison the Sony has a 55mm aperture. That said it is also smaller and lighter by quite a large margin. If the Sony had the same aperture at 600mm it would be F3.3 instead of the current F4. Yeah, the interesting thing is that they might even have been able to increase the available resolution at those ridiculous magnifications simply by having the larger aperture. That said, this is well into diminishing returns territory. Even with the enormous upsizing of the camera that they've done, using that same effective aperture on the old P900's 2000mm range would only have reduced the f-number from f/6.5 down to f/5.3. Which is still well, well into diffraction territory for a 1/2.3" sensor. Well, I quoted the diffraction properties in another thread. The P1000 is diffraction-limited at about F4. So, a 1500 mm/F4 lens would have done equally well for still photography. 1000 mm/F2.8 actually would need a higher resolution sensor to fully exploit the lens. I rather see the P1000 as a video camera. Imitating the gorgeous wildlife footage of Planet Earth which used 100x super zooms too. And the P1000 actually delivers (diffraction-limited, Rayleigh criterion) 1800mm in 4k, 3600mm in 1080p and 5400 mm in 720p. That’s this camera’s unique selling point. Only other cameras I know which do this are 6-digit $ broadcast TV cameras. I buy it falcon but that means to me the lens should be like f2.8-f5.6 even if that costs it down to 1500mm. The crop to 3000mm is simply not that costly and the 100-1500mm range is so significantly more out of diffraction absurdity. But 1500mm eq./f5.6 is 48mm ø only, much worse than 3000mm eq./f8. Always compute before commenting. 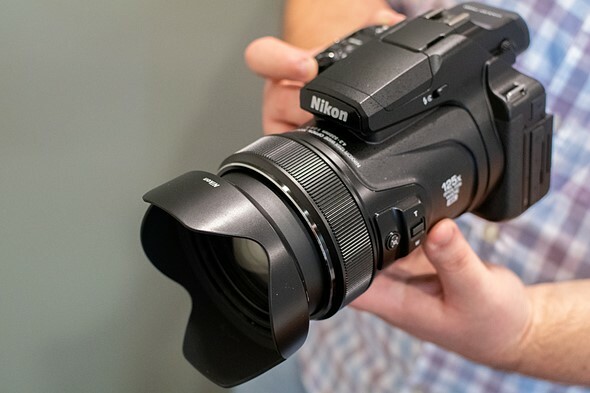 It's technically a compact, yet it looks like it's bigger than the Nikon D3400. It's certainly heavier. There is also a thing that us bird watchers like called a "record shot". This is proof of seeing and a help with ID. This would probably do that better than most.